I've always found it funny that Klezmer music has often been described as "Jewish Jazz." 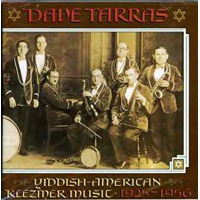 And I've found it even funnier that the great Klezmer clarinetist Dave Tarras was referred to as "The Jewish Benny Goodman." Right? Its funny. But more so, its fascinating that for many listeners, Jewish and non Jewish alike, there was a connection between Klezmer and Jazz. I'll be honest, the fundamentals of that connection are somewhat blurry to me. At its core, Klezmer music (Eastern European instrumental Jewish folk music,) has its own unique rhythms, song forms and harmonies. 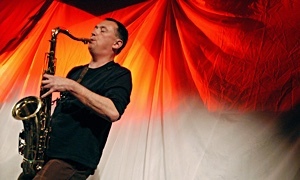 Sure, its performance is filled with improvisation, but the style of improvisation is much more related to other Eastern European, Slavic, Balkan and Middle Eastern musics. Once Klezmer music began developing in New York City in the 1920s, however, there in no question that the popular music surrounding it had major influences on its sound and style. I'm going to present to you ten of my favorite Klezmer recordings chronologically starting in the 1920s. One thing to know, is that these are all American made recordings. 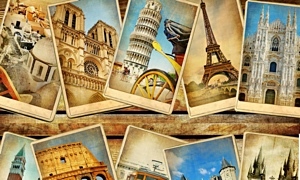 Some European recordings, made as early as around 1910, did manage to survive the second World War and are staple examples of how the music sounded before emigrating to North America. Here, however, I will focus on recordings all made in New York City. For a long time Klezmer music was played predominantly on stringed instruments like fiddles, cellos, tsimbl (small hammered dulcimer) and wooden flutes. Once Jews were playing in army bands, brass and percussion instruments became common place in Klezmer bands. 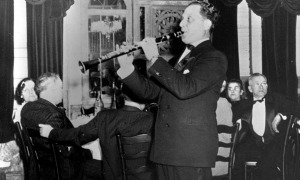 With the arrival of the recording music industry, especially in its earlier years, the louder instruments took center stage, and by the time Klezmer music found a home in New York City, the clarinet was the primary soloist. 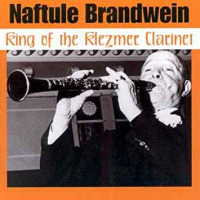 The first super star was Ukranian born clarinetist Naftule Brandwein. Brandwein was a fiery player, a ferocious improviser, and quite a character to boot. There's a famous story about Brandwein getting electrocuted after draping himself in Christmas lights on stage. This is one of my favorite tracks from Naftule. Check out his energetic runs at the cadences of each section. Also notice how he never plays any section the same way twice. As a listener, Brandwein never leaves you bored. 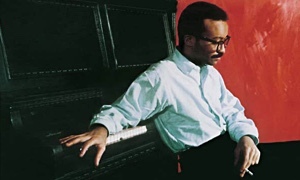 I imagine the more experimental jazz artists of the 1960s would have LOVED to hear him rip. Alongside soloists like Brandwein, many of the Jewish records being made in New York city in the first half of the twentieth century featured orchestras lead by bandleaders such as Abe Schwartz and Harry Kandel. Schwartz was a Romanian born violinist, orchestrator and composer. He moved to NYC at the turn of the century and became one of the most popular Klezmer bandleaders and recording artists. Often his band served to back up featured soloists, but the orchestra developed its own unique sounds, drawing on the popular music of the day. 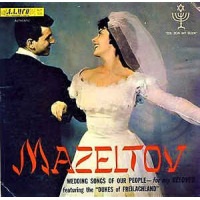 Many of these tracks have the energy and orchestration of brass bands and marching bands and this is an early example of American popular music influencing Klezmer. Clarinetist Dave Tarras showed up to New York in 1923. With a slickness and virtuosic musicality that was irresistible to listeners, he quickly became the most popular, in demand and busiest working Klezmer clarinetist. This is one of Tarras' first recordings. Its a medley featuring a lovely Kale Bazetsn/Doina and a medium tempo Freilach. Tarras' early recordings are fascinating in many ways. Firstly, it's clear that he was checking out Brandwein when he got to New York. There are intricacies in his phrasing and tone that point to this, and it speaks to Brandwein's musicianship that Tarras was emulating his style in the early years. What's also present in these recordings are Tarras' Eastern European musical roots. The rubato opening, drenched with pin point ornamentation, is seemingly equal parts Jewish cantillation and Romanian Doina. Tarras continued recording for the next five decades! His final recording was in 1978. One of the most exciting aspects of his discography, is it shows how he both developed as a musician in that span, and how strongly his influenced was in the development of the genre as a whole. 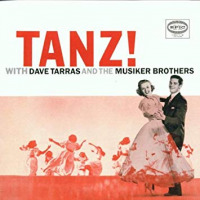 One of my favorite collections of Tarras recordings comes from the unissued "Dave Tarras Savoy Session," featuring Dave with the Lou Lockett Orchestra. It was 1946. Benny Goodman and Artie Shaw were American superstars, and producers at the Jazz label Savoy thought it would be a novel idea to present Tarras with big band accompaniment...it was a great idea. These are some of the hottest tracks around, and the opening to Good Luck remains 40 seconds of my favorite music ever tracked. To me, Tanz! is the greatest Klezmer record there is. I suppose there are valid arguments against that; Many traces of the music's Eastern European roots are hidden pretty well in the lush orchestrations, and cinematic arrangements. 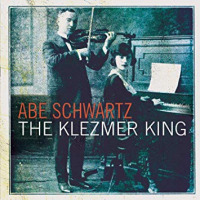 To my ears, however, it is the culmination of all the ways Klezmer developed in its time in the United States. Further listening from Tanz! "Yeminite Tanz," "Sam's Bulgar," "Silkene Pajamas"
Arguably my favorite period of recorded Klezmer music was between the years 1955 and 1960. I don't believe that musically it was any more or less strong than what came before, but the recording industry at large was making big leaps at this time. "High Fidelity" was all the rage, and in this brief period before klezmer music took a 20 year nap in the US, a handful of records were made that harbored a new sound, through high-end recording technology. The Dukes of Freilach Land, by the Epstein Brothers is the gold standard for a powerhouse Klezmer band. Max Epstein, wistfully glides on top of the band with simple, perfectly placed phrasing and ornamentation while the band drives underneath at full groove, 100% of the time. 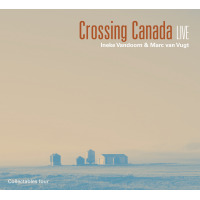 Julie, the youngest of the brothers, is the drummer, and to me shines the most in these recordings. Want to hear how a klezmer band should sound? Go no further. The Dukes. It's not as if Klezmer music just stopped all together between 1960 and 1980. That would have made a really good narrative! Guys like Tarras and the Epstein Brothers continued to play weddings and engagements in the remaining Catskills Hotels. What really happened was the life of the music went on hiatus. American Jews lost interest in hearing and promoting it, and seemingly its development and growth halted. It took a bunch of baby boomers coming of age and wondering, "where did our culture go?" for a movement to start up in the late 1970s that would be known as the Klezmer Revival. The Klezmer Conservatory Band started as a Jewish music jam session lead by Hankus Netsky, a young multi-instrumentalist and professor at the New England Conservatory of Music in Boston. Hankus, and the folks he surrounded himself with, slowed down and transcribed old recordings, recreating the sounds of the larger groups like Abe Schwartz's orchestra. At the beginning of the revival period, recreation of old records was crucial to re-building and renewing the genre. 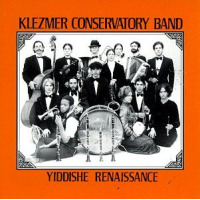 One of the most popular bands from the early Klezmer Revival, the KCB also harbored many young enthusiastic players (mostly NEC students) who would become major contributors to the genre in years to come. Frank London, Alan Bern, Judy Bressler, Dave Harris, Deborah Strauss, Jeff Warschauer and Don Byron were all members of the band. Further Revival Listening: Andy Statman and Zev Feldman: Jewish Klezmer Music, Kapelye: Levine and his Flying Machine, Brave Old World: Beyond the Pale. 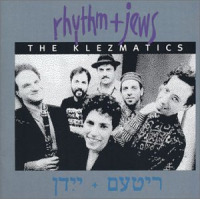 The Klezmatics are one of the most popular klezmer bands from the last thirty years. Their second full length album, Rhythm and Jews, still gets a spin in my boom box pretty regularly. There is a freshness and a sense of musical liberty that is so tangible on this record. This track is a re-imagination of a great tune from Naftule Brandwein. The playing from the front line of David Krakauer, Alicia Svigals and Frank London deserves a tip of the hat. As does the eerie vocal improv breakdown in the middle. This was a new kind of production for the genre, and cracked open a door for what contemporary treatment of traditional tunes could mean. I'm aware that I just skipped twenty years. And a lot happened in that time period. The Klezmer scene saw an international expansion, with bands popping up all over the world. The revival morphed into a multi-faceted cultural world, and musically the output went in various directions. In New York City, the Radical Jewish Culture / Knitting Factory "Down-Town" scene, spearheaded by John Zorn, spawned avant-garde modernist acts like Hasidic New Wave and Naftule's Dream. Meanwhile, neo-traditionalist groups like Khevrisa and Budowitz were taking Klezmer music in a whole other programatic direction. The Berkley, California based trio Veretski Pass, has always stood out to me as an interesting and very musically satisfying product of the last two decades of Klezmer development. Featuring violinist Cookie Segelstein, Accordionist/Tsimblist Joshua Horowitz, and Cellist Stuart Brotman, this group seamlessly bounces between neo-traditionalism and the avant-garde at all times, while keeping their band dynamic perfectly intact. I could listen to them all day, and sometimes do. I'm writing this as I gear up to release Kosher Style, my first studio album of all brand new Klezmer music in over a decade! Going through a century's worth of recorded music has reminded me of how vast my influences are. The idea for this record was to imagine the direction Klezmer music could have taken if it had continued with its progression in the 1960s. My album aims to continue a lineage right where the chain was cut. Even though it presents itself as a period piece, it has equal footing in the contemporary klezmer landscape. Klezmorim throughout the history of the music have always integrated the sounds they were surrounded by, I'm happy to fit that mold as well. 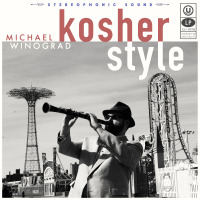 Building a Jazz Library Michael Winograd Clandestine Label Services United States New York New York City Klezmer Jewish Music Tanz!